Join more than 75 dedicated members across the watershed and make a special commitment to strengthen the work of the Georges River Land Trust as a member of the White Oak Society. Donors in this society commit to annual membership support of $500 or more each year, and pledge to grow the organization by serving on committees, encouraging friends and neighbors to join in membership, and being a Land Trust ambassador in the community. White Oak Society members gather each year to celebrate successes and encourage each other to stay committed to the places and communities we love. Society members are kept up to date on new projects and initiatives, and help us spread the word about events and our conservation accomplishments. 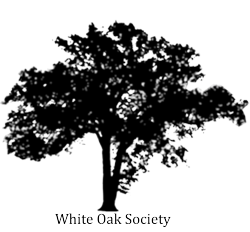 You are Invited to Join the White Oak Society! You can start making a bigger impact on your community right here, by renewing your membership at a level of $42 per month or more. $42 | Minimum White Oak Society membership gift. $50 | Cover the monitoring and care for two conserved properties each year. $75 | 500 feet of bog bridging on the Georges Highland Path. $100 | Cover 1/5th of the stewardship cost for a new conservation easement. Would you like to pay the credit card processing fee? *Be certain to include your email for confirmation of your gift. Prefer to Simply Renew Your Membership? We welcome membership at any level that is appropriate for you. If you are a business owner, then you know effective partnerships can make a big difference to your success. Our partners help us in many ways, each according to their ability and talents. Some volunteer employee time, others display our maps and brochures, and others make financial contributions toward our work. In return, we promote them to our 1,000 members, offer opportunities for exposure, discounts on some advertising at the Free Press, and other benefits. Talk to the Executive Director about how we can work together to make our watershed a better place for your business and ours, and consider making a donation at either of the secure links below. They will keep you right here on our site, and lead to our donation forms.